These days we hear lots of calls to be more organised, efficient and productive. Injunctions to “Achieve more in less time”, “Beat the work overload”, “Work smart” all sound inspiring, but are they really achievable? And if so, what are the magic actions to take to get to this degree of perfection? Today I’ll take a look at one of the time management methods called GTD, whose core promise is to boost your productivity in a stress-free manner. I am also going to give you a couple of business software tools that can actually help implement GTD ideas, and make them an integral part of your daily life. GTD is shorthand for Getting Things Done, a productivity methodology pioneered by David Allen. The premise is that today people – especially business people – have to remember a lot of things they need to do. Keeping track of them takes up an inordinate amount of your brain’s capacity and energy, and results in stress and frustration. The GTD method says we have to free our mind from remembering tasks and concentrate on actually performing them. 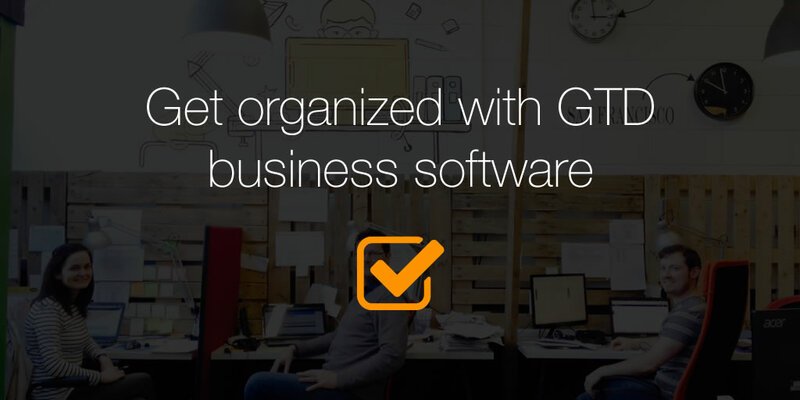 GTD says it’s possible to transform the workload into an organized system, and it’s possible to do in a stress-free switch. Collect any relevant inbound information, coming through emails, phone calls, articles, requests from colleagues, ideas, etc. Empty this information from your brain into a trusted system (it can be anything – from a computer program to a notepad, as long as it’s outside your head. Ask yourself if every task on your list requires an action from you to move it forward. If it not, maybe add it to a “Someday” list or keep it as a reference file. Is it actionable? Then make a decision what is the next action. If the action requires just a couple of minutes, perform it immediately. Can you delegate the task? Then add a reminder to your “Waiting for” list. If the task is complex and consists of more actions, record it in your Projects list. Review your actions and keep your list up-to-date. A weekly review helps determine if the system is working for you and will allow you to make necessary adjustments. If you don’t keep your action list up-to-date you start to lose your confidence in the method. Once your ‘external memory’ is organized into a trusted system that works, you’ll develop a great feeling of order and control. For example, context, if you group your tasks by context, such as work, town, etc. you can perform these tasks more efficiently. Other criteria could be by the amount of time it takes, or even the time of the day when you have the most energy – e.g. perform the most difficult tasks when you’re full flight and do the routine stuff in the lull periods. The last criteria is priority – start with the most important and urgent actions. This is a summarized version of GTD on how to keep up with a busy workflow and stay in control. Since Getting Things Done method became popular, some business applications have applied GTD within their workflow. Here are three business applications (one ours) that employ the GTD concept and will help integrate GTD into your daily workflow. OnePageCRM helps businesses manage their relationships with prospects and customers. It provides a single application to store customer and sales related information. This enables companies to attract new customers and retain their existing ones, in less time and at less cost. OnePageCRM is focused on sales activity and turns it into a GTD-style workflow. By putting every prospect or customer in a list that’s sorted by their “Next Action”, the sales person will in a natural way, move prospects through the sales funnel towards a sale. One glance at the main screen lets the salesperson know what actions they need to take now, today and tomorrow. That uncluttered focus helps to move forward every single sale to success. Nozbe is a time and project management application for busy professionals and their teams. The app helps not only manage tasks and projects, but most importantly collaborate with others and communicate through tasks so that everyone is clear what needs to be done at any particular moment. Nozbe focuses on three key GTD elements: Projects, Contexts and Next Actions – users can organize tasks into projects, execute them in contexts and quickly “star” their next actions and focus on their Next Actions list throughout the day. When they collaborate, delegating actions makes them someone else’s Next Actions. The idea is to help the team learn GTD by using Nozbe (aka “learning by doing”) even when they don’t want to read the amazing David Allen’s GTD book. These three core functions are further enhanced by an easy way to “dump stuff” into “Inbox” and processing it later. Nozbe tries to be user’s “trusted system” for storing tasks and projects and focusing on what really needs to be done next. Tudumo is a powerful to-do list. Instead of managing many lists scattered all over computer, Tudumo keeps everything together. It allows to see all tasks, or focus on a subset and ignore everything else. Tudumo distills GTD principles into a clean and simple user interface. The shortcut keys makes entering actions fast and easy. Tudumo helps focus on today’s work by reducing distractions. With Tudumo, the overwhelming workload becomes a structured set of tasks. With Tudumo your focus is only on the actions that have to be done next. Have you ever tried to apply GTD principles in your life? Did it help you succeed?